The seasoning in the cave is a practice that dates back to ancient days. 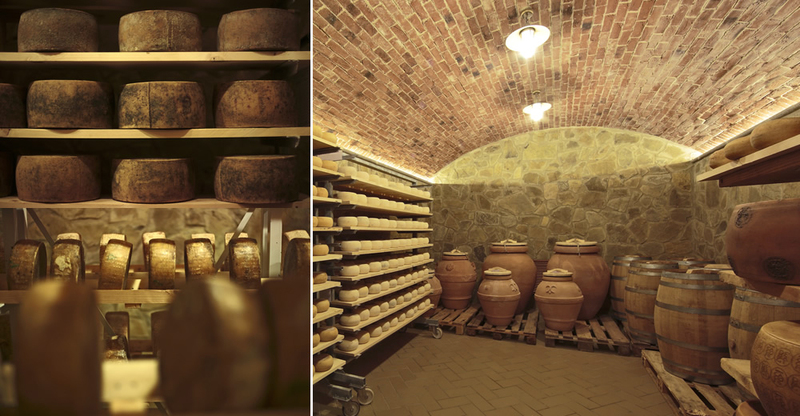 Light , humidity and temperature are three decisive elements for the proper maturation of cheese and, before they could be controlled, the natural caves which were mainly in Central Italy, were the ideal solution to refine the cheese. So far, the cave , with its particular shape and its microclimate, it is the best environment for the process of aging, especially if the use of appropriate technologies (thermometers, moisture meters ) allows you to check in detail the whole process. Two caves covered in stone have been built inside the DeMagi headquarters, digging into the ground and installing a technological system that allows you to remotely control the microclimate of both. A clear choice, strongly desired to refine the cheese in the best way, or by combining the teachings of tradition with the benefits of technology. Inside the caves the cheeses are seasoned on axes of different woods, according to the type of cheese, or inside barrels in the case of herbed cheeses or a particular maturation (under must , for example). The presence of the two caves, the automation system and webcams allows you to mature each cheese in the best way, the most suitable to enhance the properties at any time by controlling the microclimate of its maturing environment. But not only. The caves also allow you to experiment with combinations and special seasoning processes in order to literally create a unique variety, able to excel with fragrance, textures and flavors never tasted before.